AKVIS Chameleon Chameleon is an efficient and easy to handle tool for photo collage creation. * Montage. 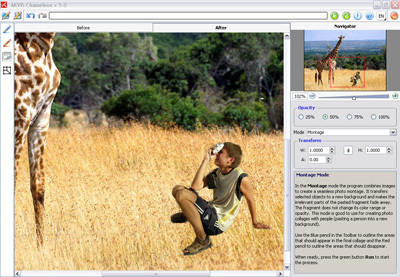 In this mode the program combines images to create a seamless photo montage. It transfers selected objects to a new background and makes the irrelevant parts of the pasted fragment fade away. The object does not change its color range or opacity. This mode is good to use for creating photo collages with people. * Blend Mode. In this mode the program does not only smoothes the borders of the inserted object and adjusts its color range, but it also makes the object semi-transparent, so that the texture and the relief of the primary image can be seen through. Use this mode if you want to "dissolve" the inserted image in the background. AKVIS Chameleon plug-in is compatible with Adobe Photoshop, Corel (Jasc) Paint Shop Pro, Ulead Photo Impact, etc. O AKVIS Chameleon - Collage Creation Software for automatic adjustment of inserted objects to the target image color range. Inserted objects blend with the environment like chameleons do. The software has three modes: Montage, Chameleon and Blend Mode. See above information and user's reviews about AKVIS Chameleon Chameleon is an efficient and easy to handle tool for photo collage creation.